JETS Express Services Sdn Bhd (JETS) was incorporated in 1983 and is a licensed customs broker and an international freight forwarder. The company has created a solid relationship with major air and shipping lines and provides services such as international and domestic freight forwarding, export and import customs brokerage, and warehousing services and storage. The company’s headquarters is located in Bandar Sunway and now uses TimeTec for time attendance. Using the TA100C device, the company has installed the system at the headquarters and at two other branches in Port Klang and an office in KLIA. TimeTec is a cloud solution for time attendance suitable for any business and industry due to an automated system and access to features for workforce management. With the use of cloud technology, TimeTec allows companies to access their system from anywhere at anytime via web login and with an Internet connection. The main features of TimeTec are designed to manage a companies attendance and scheduling by utilising attendance sheets, displayed in the TimeTec system itself. Administrators of the system can configure the company details such as company profile, day type in workforce, leave type, remarks and work code, and notifications as well as determining the number of users added to the system. Couple these with configurations to clocking schedule and customization of duty rosters, and transactions to the terminal device will then be displayed in the attendance sheet. TimeTec puts all the features of time attendance into one access point that also promotes mobility. Administrators can access the system easily to view the staff performance and to manage the workforce scheduling. Employees will also benefit from the cloud system as they can now evaluate their own performance and receive notifications concerning announcements, attendance, or holiday and events. 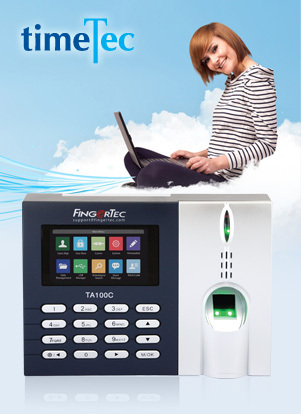 Using the TA100C as the terminal device gives JETS access to biometrics technology for fingerprint alongside RFID card and passcode verification methods. Excel Systems, an established company that provides human resource solutions for payroll and time attendance, successfully installed TimeTec for JETS. Established in 1989, Excel Systems has been FingerTec’s distributor for the Malaysian market since 2005 and has a large number of high profile clients including Toshiba, Avon, Mary Kay, and now JETS Express Services.